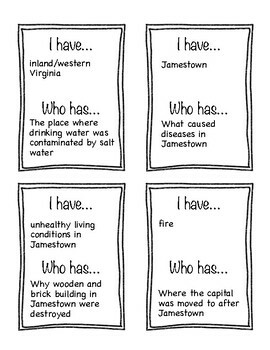 This "I have, Who has?" 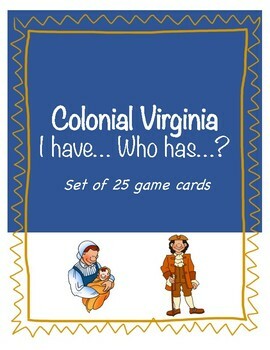 game is a fun way to review the Colonial Virginia unit. 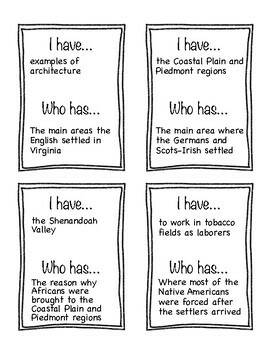 The game covers Virginia Studies SOL standards (VS.4), understandings, and essential knowledge. The file includes 25 game cards and an answer key. I recommend beginning with the card that states "I have cash crop." This is a more difficult "I have, Who has?" so I like to give a set of cards to groups of students and have them put the circular puzzle together before doing it aloud as a class. Thank you to Krista Wallden for the borders. Find them here.